Facial implants are made from solid, biocompatible materials and are designed to improve or augment the physical structure of your face. The type of facial implants used depends on an evaluation of your goals, the features you wish to correct, and the surgeon’s best judgement. Full, defined cheeks can significantly enhance a person’s face. They can add definition and add character to a person. Cheek augmentation can help give you strong looking cheek bones for people who don’t have them or return aging cheeks to their original fullness. Cheek augmentation procedures are performed by adding silicone implants to the target area to achieve the desired effect. A small incision is made inside the mouth and the cheek implant is positioned in a small pocket under the skin. By going through the mouth scarring is invisible. 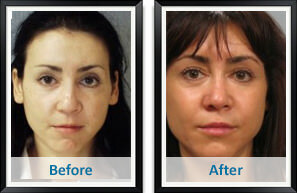 With all of the cheek implant choices available, the possibilities for a cheek augmentation are nearly endless. Chin augmentation, or chin implant surgery, is a cosmetic procedure that is used to “strengthen” the appearance of the chin and add definition. This procedure is performed much like a breast implant procedure. A small incision is made under the chin and a small implant situated over the chin bone. Because the incision is made under the chin, scarring is nearly invisible. With over 100 different sizes and shapes of chin implants available, almost any desired look can be achieved by a chin augmentation surgery. Why Are Chin Implants So Popular? Many plastic surgeons speculate that the increase in chin augmentation procedures is the result of social media and improved video technology. As people spend more time in video conferences, our chins are featured more prominently. Seeing one’s chin front and center on a cellphone or video screen brings a feature to our attention that may otherwise be overlooked. Providing a balance to one’s face.